i60x Standalone USB Data Acquisition System. Released instruNet version v3.7 software. Released instruNet version 3.0 software. 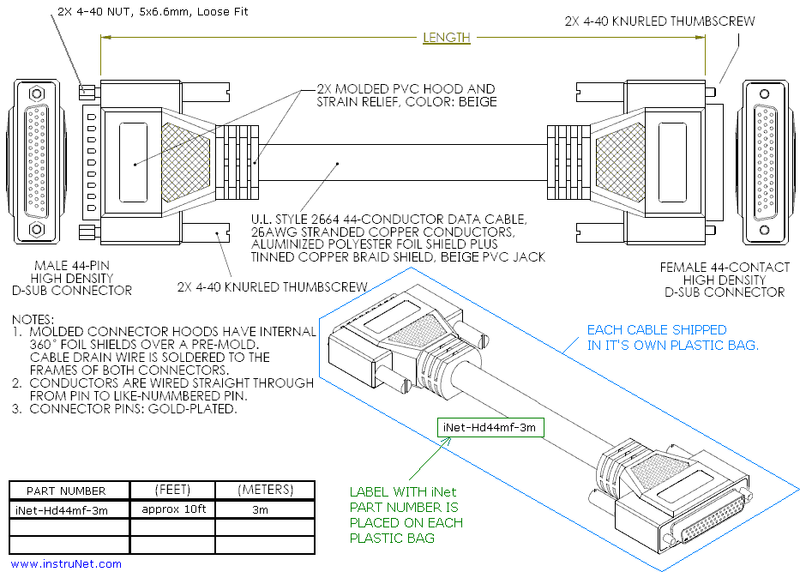 Db25 Male-to-Female cable part numbers changed from "#iNet-Cable-..ft" to "#iNet-Db25-..ft". Prices increased for the following products: #i312.8, #i312.8eu, #i330. Discontinued use of hard copy User's Manual in favor of placing all documentation on the www.instrunet.com website, and installing a local copy of this website on end user computer during instruNet software install. This enables end user to access all documnentation w/o internet connection. Discontinued support for Windows 95/98/Me/NT/2K computers. instruNet version ≥ 3.0 software does NOT run on Windows 95/98/Me/NT/2K computers. For more details on what is compatible with what, see instruNet Compatibility. instruNet software v2 supported Windows 95/98/Me/Nt/2k with the i200, i230 and i100 products (not i4xx cards, not i240/i60x USB). For details on installing i200/i230 controller cards into Windows 95/98/Me computers, click here. Note that the i230 card never supported Windows NT. To download the older version 2.x software, click here . Discontinued software interfaces for: HPVee software, TestPoint software, Microsoft BASIC ≤ 6.0 (1998), Microsoft C version ≤ 6.0 (1998). SuperScope II software no longer supports Macintosh computers manufactured after 1999. SoundScope software no longer supports Macintosh computers (in native mode) manufactured after 1999. MacADIOS hardware, which was manufactured between 1985 and 1995, was discontinued in 1996 due to not being compatible with the newer computers.